P.E.R. Belle Arti was established in 1979 by its founder Riccardo Elio Pieraccini who, reliant on his ability and experiences, aimed at creating a handcraft product with the most modern technologies. Therefore P.E.R. 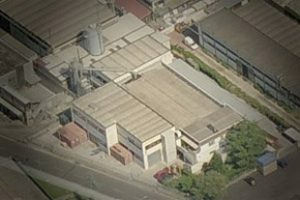 has specialised itself in the production of stretched canvases, offering the market products of the utmost reliability, which are carefully controlled from the origin through the whole cycle of production. In Italy today P.E.R. can count on a sale force characterized by professional agents, while the foreign trade, where it has been known and appreciated for many years, is managed directly. 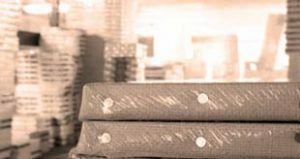 During the years the business has grown up thanks to its constant work, never forgetting the owner’s passion for well-done products. P.E.R.’s mission is to combine tradition, experience and technology to satisfy all artists’ requests. Since 2004 P.E.R. 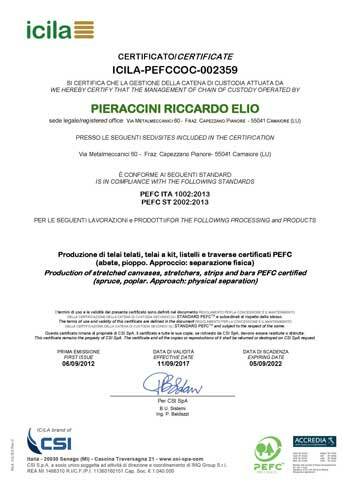 has been a PEFC certified company, the only one in Italy, at the moment, in the industry of painting supports. P.E.R. has always been distinguished for the attention given to the environment contributing to its sustainable development. The PEFC certification and wood control are some signs of its social responsibility policy towards its stakeholders. Every kind of wood manufactured in our carpentry is controlled and comes from countries where the risk of violating these principles is very low, such as Italy and Austria.